OSU-Tulsa follows the same academic calendar as OSU's main campus in Stillwater. Learn about OSU's Academic Intergrity Policy, which OSU-Tulsa also follows. Learn about applying and getting admitted to OSU-Tulsa. Schedule an advising appointment, learn about degree requirements, enroll for classes or learn how to become an OSU-Tulsa student. The Bursar Office is responsible for all financial transactions between students and the University. Students can visit the Bursar Office to pay their bill or find out information about a refund. View information about schedules for OSU-Tulsa classes. View OSU's course catalog, which includes classes in both Stillwater and Tulsa. In compliance with the Jeanne Clery Disclosure of Campus Security Policy and Campus Crime Statistics Act, Oklahoma State University-Tulsa provides a report on the numbers and types of crimes on the OSU-Tulsa campus for the previous three years. View a list of all degree programs offered at OSU-Tulsa. Information for graduating students about applying for their diploma. OSU-Tulsa follows the same enrollment schedule as the main OSU campus in Stillwater. Find out when you are eligible to enroll for classes. Information about enrolling for classes online and in person. 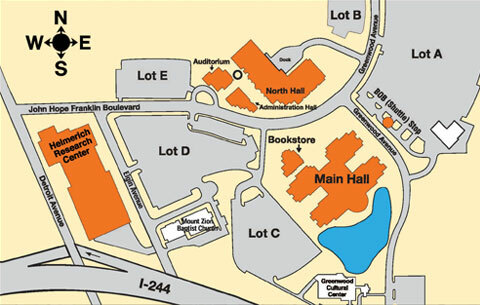 OSU-Tulsa follows the same final exam schedule as the the main OSU campus in Stillwater. Learn about scholarships, grants, work-study, loans and other programs to help pay for college. Registration and transcript holds are restrictions placed on student accounts when specific action is required from students to allow enrollment at OSU or release of official academic documents such as transcripts and diplomas. Information for prospective, new and continuing graduate students at OSU-Tulsa. Procedures for requesting and picking up transcripts. View the Student Code of Conduct. Visit the OSU School of International Studies website to learn about study abroad opportunities. Information about tuition and fees for attending OSU-Tulsa.